On the square named up after the famous Hungarian composer Ferenc Liszt, you can find a great diversity, and many great offers when it comes to feeding your stomach. Several restaurants can be found on this square, and the things they have in common is that their prices are quite low. They will serve you cheaper than for example Belcanto and Gundel, still the quality is high and the atmosphere is good. Especially in the summer, because then they all move their tables and chairs out to the square, and from early morning to late night, the street is full of life and people drinking, eating and having fun. All the restaurants are good, but we recommend to you Menza especially! You can also find a Tourinform at the square, where you can get information about concerts, maps, and whatever you need help for concerning your stay. 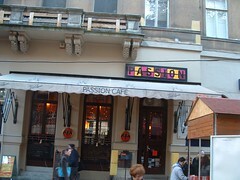 Among the restaurants at the Ferenc Liszt Square you can find: Fresco Liszt, Barokko, Passion, Menza and Buena Vista. Why (unemployed) Hungarians need to get busy blogging!